THE REVIEW: Chappie is filled with wonderfully original and innovative ideas but those ideas are limited and contained within a horribly constructed story. Director Neill Blomkamp, who’s also helmed District 9 and Elysium, is well known for the worlds and concepts he creates. The premise behind Chappie is rich and highly detailed — a near-future where the police force is replaced primarily by robots and the lead developer, Deon Wilson (Dev Patel), is creating the world’s first true artificial intelligence. However, instead of directing the focus of Chappie more towards a concept-film that paints a picture of this future, Blomkamp attempts (and fails) to tell a story within the world. It’s through trying to tell a story that things fall apart. Characters are shallow and poorly developed. While a part of that may be due to a majority of the actors being South African natives — as opposed to more experienced/trained actors — a large part is due to the writing. We don’t get a good look at where these characters might be coming from or their motivation for their actions, with a few minor exceptions. For example, Vincent Moore (Hugh Jackman) we learn was in the military before becoming an engineer for Tetravaal. This is good because it gives us insight into why he goes to such drastic (and violent) lengths to get his way but it is still quite a stretch for the situation presented in the film. We see his grudge with Deon because his Scout program is taking the funding for his Moose program but to go full-on Revenge Mode over the course of five days (the elapsed time of the film) is too far-fetched. Worst of all is the litany of minor story annoyances. There are far more than I can count and are all well beyond the realm of suspension of disbelief. The following list is by no means all-inclusive nor necessarily representative, but should give you an idea of some of the issues. Ninja and his gang abducts Deon to get him to shut off the Scouts. Ok, but why do they have to continue the macho tough-guy persona after they realize he’s just a programmer and not another gang member. Ninja shouldn’t be all-psycho all the time, and yet, it seems like there’s never a moment he’s not freaking out. No one reports Vincent for pulling a gun in the workplace? Maybe it’s just South Africa, but to me it seems like someone went over the line. 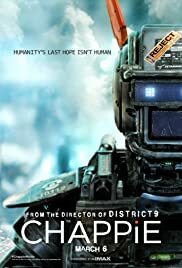 Chappie is “injured” multiple times, including being torched with a Molotov cocktail. Each time he’ll walk it off like he’s a human (limping, moving slowly, slumping against a wall for support) before eventually “returning” back to normal. Problem is, he’s a robot. His functionality will remain constant over time, or decrease depending on how serious the damage. For example, Vincent cuts his arm off in one scene. Chappie loses that functionality before Ninja and Yolandi repair it. But no repairs occur after several rounds of gunfire and that Molotov cocktail and Chappie somehow returns to normal strength. Why then must he “act” as though he’s injured and limp around? He’s either damaged, or not. He’s not a self-healing human who will get better all by himself over time. Deon knows he left the guard key in Chappie and needs to get it back. So why, when it’s just him and the nice Yolandi (and no psychotic Ninja) doesn’t he remove it? Is it so vital to get Chappie reading, painting, and expressing himself that he can’t remove the guard key? It would solve a lot of the problems. At the end, why is Vincent alone in the room operating the Moose. Johannesburg is falling apart and the entire company is freaking out. Someone else would be in the room so they could have direct feedback on the status of their damage-control. I could go on and on with complaints about story and characters, but I think you get the idea. Despite having a great premise that could have made for an extraordinary film, the execution and resulting story is quite appalling. While it is amusing to see Chappie develop, learn how to be a gangsta, and make people go “sleepy-weepy”, the movie Chappie isn’t an overall joy to watch. It does get some so-bad-it’s-good points, but this isn’t a film you should necessarily see, and is definitely not one you need to rush out to see in theaters. Chappie opens in theaters today, March 6, 2015.